This week I did a talk to a group of runners who are a part of Josie Wadja‘s Running Room running clinic. The program is for novice runners who are looking to gain knowledge about running and racing, or for those looking for a training group. 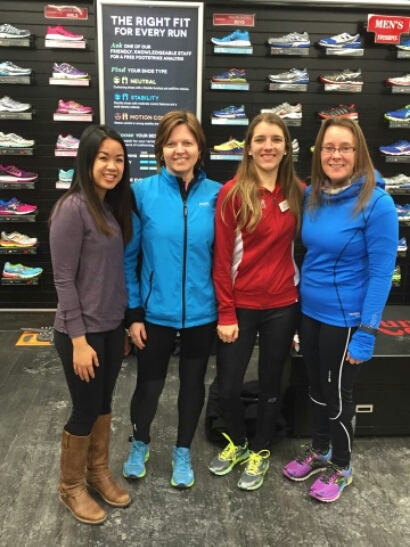 You can check out Running Room’s programs here. Running Room is great for bringing running to the masses and helping people who have maybe never put on a pair of running shoes in their life. Fun fact: Running Room is a family run business started by John Stanton in 1984 because he wanted to purchase quality running shoes from someone knowledgeable about the sport. A small group gutted out the -30 degree weather to come out to the talk. The group normally runs afterwards but not Thursday night with that windchill, which brought the typical numbers down. It’s easy to forget how much you’ve progressed over the years and it’s great to talk to an enthusiastic group looking to learn everything they can. We talked about progression over the years and being patient, fueling, feelings during the race, injuries, and finding the right program for you. I showed them some of my favorite strength training exercises that help to strengthen glutes, abductors, adductors, and foot strength to help ward off injuries. Handing out Goodlife swag at the end was a must. Feels great to reflect on my own knowledge and process as a runner and to reflect on my own progression. It keeps you grounded especially if training isn’t going the way you expected. Just knowing that you can always get better and looking back at how far you’ve come. On that note, I’m very thankful to those who got me here – my Durham Dragons coaches Craig and Dale who set me on this journey of competing at a higher level and training full time, my parents for always being there to take me to practices all those years ago and cheering me on in my races, and to Josh who has given me unbelievable confidence and belief in myself that the sky’s the limit. Without them, I would not be here today. It’s a good reminder that no sport is truly individualistic, as Jamie Adjetey-Nelson (Windsor’s greatest decathlete) says. Behind every athlete are the people who support them and without whom greatness could not be possible. Say thanks to those who brought you to where you are today. This entry was posted in advice, Community Events, injury prevention, running, Strength training, training and tagged running, Running Room, training. Bookmark the permalink.